Can Music Help You Exercise? Music plays a very influential role in affecting your mood at any given time. Listening to instrumental music can calm your inner senses and relax your mind while joyful melodies can lift your spirit and set your day off to a great start. 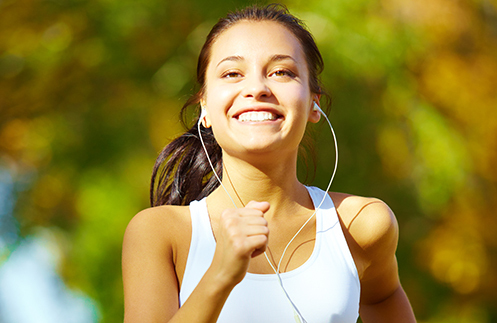 Did you know that music can positively influence your exercise routine in the same way? According to Nina Kraus, professor of Neurobiology at Northwestern University in Illinois, humans and songbirds are the only creatures that automatically feel the beat of a song. This means that our bodies are equipped with a natural ability to follow a pattern of movement that stems from sounds that entice our sense of hearing. Listening to a slow beat leads you to move accordingly in a slow pace and a fast beat inspires your legs and arms to pick up the same pace when you walk run jog jump or perform particular movements. Select the right music player. Your music player should play tunes without interrupting your routine. Simple things like picking out earpieces that fit snugly in your ears go a long way. Create a playlist of your favorite songs. Pick songs that wake you up and push you to move your body. Warm-up for the first 5 to 10 minutes with a slow to moderate tempo song. Tailor-fit your songs to your exercise. If you are into long-distance running choose songs with a fast steady rhythm. For interval-based exercises throw in some slow jams to calm your muscles down. Cool down with slow music. This aids in slowing down your body movements and heart rate. As you exercise with music, take Del Monte Fit n' Right to regain your lost fluids and aid the body in burning unwanted calories.